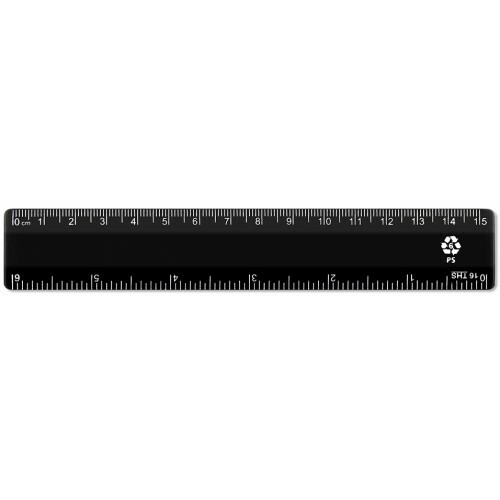 The Black Recycled Plastic Ruler is an effective tool for everyone from students through to professionals. It has a traditional design that is easy-to-use and highly effective at providing accurate measurements every single time. The recycled plastic use sits in line with the current drive to focus on eco-friendly production. In turn, it gives it both lightweight and hardwearing properties. The rule is easy to carry around in backpacks and pencil cases alike while withstanding use by heavy hands. It has a slight flex, to minimise the risk of snapping and rounded corners work to eliminate injury if used inappropriately. The dark black design is bold but understated and pairs effortlessly with the stark white line and number markers. For measurements up to and including 6" or 15cm, it is the only tool you'll need. The font used is clear, highly visual and ensure you are able to take measurements in no time at all. No matter whether you're taking the distance of two marks on a piece of paper or drawing up an architects design for that new kitchen, this ruler will stand by your side. Here at The Ruler Company, we understand the importance of strong materials, long lasting service and the best price when it comes to bulk purchases. Our black recycled rulers are available in orders over 10 with a reduced price of £0.22 per ruler. Or, for larger orders of 100+ rulers, each one will be reduced to just £0.16 to fit within any budget.